The Gorilla Organization will be represented by three runners at this year's Virgin Money London Marathon. Once more, the Gorilla Organization will be represented at this year’s Virgin Money London Marathon, with three brave runners set to go the extra mile (or 26) for great apes in danger. Over the past few weeks, all three members of ‘Team Gorilla’ have been stepping up their training regimes ahead of the world-famous marathon, set to take place this year on Sunday 22 April. They’ve also been stepping up their fundraising efforts, with every mile they run guaranteed to raise vital funds to help support gorilla conservation efforts in Africa. 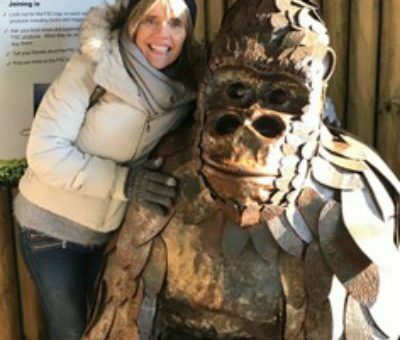 Remarkably, the upcoming London Marathon will be the first time two members of Team Gorilla have attempted to run such a distance. For Fiona Mills, this is just the latest charity challenge that will push her to her limits. She’s already scaled Scafell Pike and Helvellyn and has a half-marathon under her belt. Now she’s determined to go one better in a bid to help gorillas. Also set to run his first marathon in April is Max. Over the past five years, the London-based lawyer has run a number of half-marathons, raising money for a number of charities, including causes relating to missing people and to those battling cancer. “This year, however, I decided to focus my attention on gorillas. Their population is declining dramatically, and I want to help raise awareness of this,” he says. To record his marathon efforts, Max has set up his own Instagram account. Hopes high ahead of new mountain gorilla census	Great Gorilla Run returns for 2018 special!